Posted on September 7, 2011	by Katy K.
I have always loved costumes. I wear them whenever reasonably possible, for Halloween, for Talk like a Pirate Day, and of course through the SCA when my schedule permits. Many of our SCA friends now seem to be doing Steampunk as well, and while I haven’t yet gone to an event or even put a costume together, I couldn’t resist checking out this book when I came across it at the library. Steampunk-style Jewelry by Jean Campbell Steampunk, for this purpose, is loosely defined as fantasy Victorian with an emphasis on the beauty of early mechanical pieces. The jewelry is projects intended for the reader to be able to reproduce and use as inspiration. There are necklaces, earrings and bracelets. They use bead or craft store bits and wire, often combined with gears and other parts from cannibalized antique watches or reproduced old photographs. There is a lengthy introduction on the techniques used. When hazardous materials are used, cautions are given both in the intro and in the individual projects. The instructions seem thorough, including lists of materials and which steps might need practicing on scrap materials first, which, as a novice would-be jewelry-maker, I appreciate. Campbell is the senior editor of Beadwork magazine, and though many designers are featured here, her experience shows. The designs are beautiful. I especially enjoy the numerous designs where the delicately balanced gears are designed to spin while being worn. The biggest caution that I have from just reading the book is that many of the designs use found materials that could be difficult or impossible to duplicate. One ring, for example, called for a 28mm men’s watch movement. Right. My love and my mother were both appalled at taking apart potentially fixable watches. I can’t say how steamers usually come by their gears, though I think reusing is vastly preferably to discarding them. I will note that we have since found new gears at JoAnn’s. They are really pretty in either case. Interspersed with the jewelry projects are multiple two-page spreads on various aspects of steampunk culture: the costumes; modifying other items to look Victorian (a computer and a motorcycle are featured); steampunk books, movies, and bands. There is a small gallery at the end of jewelry without instructions. 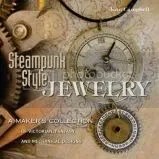 All in all, this a very well done book, both for jewelry-makers and for steampunk aficionados. This entry was posted in Uncategorized and tagged crafts, jewelry, steampunk. Bookmark the permalink.